JNN 10 May 2014 Beijing : The idea of traveling between the United States and China without flying might seem ridiculous to virtually everyone, but if Beijing gets its way that’s exactly what will be possible in the future. The most ambitious part of the project would, of course, involve constructing the undersea tunnel that would make traveling across the Bering Strait possible. At 200km (125 miles) long, the tunnel would represent a daunting engineering challenge – that’s four times the length of the Channel Tunnel connecting the United Kingdom to France – but China Daily stated the technology is “already in place” and will be used in a separate high-speed rail project. Overall, the Guardian notes the entire trip would clock in at 13,000 km (nearly 8,100 miles) – extending even further than the Trans-Siberian Railway. 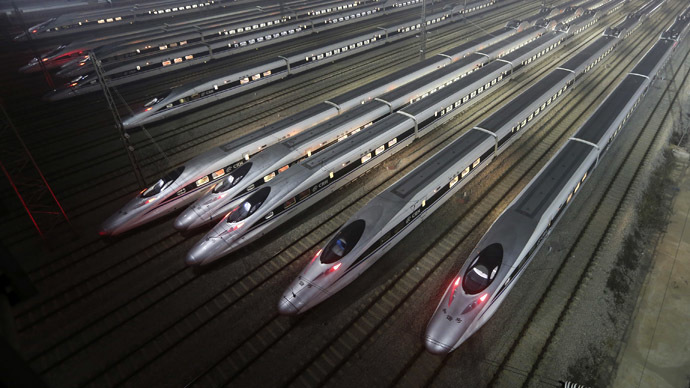 The plan is currently known as the “China-Russia-Canada-America” line, and experts project the entire journey would take about two days, with the train moving at an average speed of 220 miles per hour. Additionally, China Daily “the project will be funded and constructed by China,” though the details have yet to be ironed out. “Right now we’re already in discussions. Russia has already been thinking about this for many years,”said Wang Mengshu of the Chinese Academy of Engineering. Still, many questions remain unanswered. The Guardian reported that no other railway experts have expressed support for the plan, while it’s uncertain whether or not the US or Canada have been briefed or consulted on the plan. According to the Beijing Times, the China-US railway is just one of four ambitious projects he country is thinking about undertaking. One line would connect China to London with stops in Paris, Berlin, and Moscow, while another would link the country to countries like Iran and Turkey. A fourth line, meanwhile, would stretch from China to Singapore, stopping in Vietnam, Cambodia, Thailand, and Malaysia.